You can help us map existing infestations. 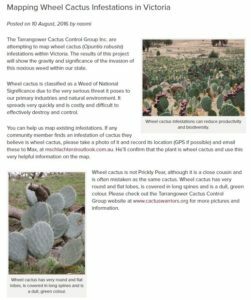 If any community member finds an infestation of cactus they believe is wheel cactus, please take a photo of it and record its location (GPS if possible) and email these to Max, at mschlachter@outlook.com.au. He’ll confirm that the plant is wheel cactus and use this very helpful information on the map.